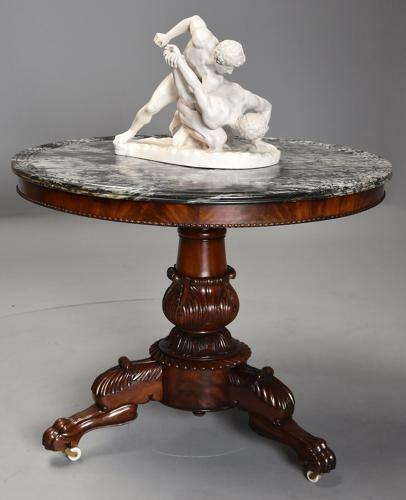 The table consists of the original marble top, this being a black and white veined marble, possibly Vert Maurin, with a moulded outer edge supported by a segmented curl mahogany frieze with ball turned moulding below. This leads down to a turned and finely carved baluster column with foliate and gadroon carved decoration, the base being tri-form and finely carved in the typical French Empire style consisting of three superbly carved legs with foliate carved decoration, terminating with carved paw feet and supported on original porcelain castors. PLEASE NOTE: the figure on the table is for photographic purposes only and is not included in the price.